Please call 0086-021-63515988 to book or inquire the details about the tour. We do not run this tour. The carefully designed big bus tour takes you to all the famous landmarks: from the Jade Buddha temple to the Oriental Pearl Television Tower, from People’s Square to the Bund, Shanghai’s world famous waterfront. These open-top buses run regularly and you are able to hop on and off at a variety of interesting places. Your 24 hour Big Bus ticket provides access to both of the Big Bus Tour routes. Together they enable you to experience the cultural heritage and stunning architecture that makes Shanghai such a fascinating city. Please sit back, relax, and let Big Bus deliver the perfect introduction to Shanghai. The City Tour is the longest of the two big bus tour routes. Buses of the city tour route depart from People&apos;s Square every 30 minutes from 9.00am until 5.00pm and passes three Shanghai districts: Huangpu, Jing’An and Luwan. It has been carefully designed to give you insight into Shanghai’s heritage and culture. It provides the opportunity to discover the beautifully restored traditional houses of Xin Tian Di, and gems such as the Jing’an Temple and Jade Buddha Temple. You’ll discover Shanghai’s distinctive blend of traditional and contemporary buildings, and visit the spectacular Yu Garden and the modern Nanjing Road and Cool Docks. Walking along The Bund, striking views of the towering skyline on the Pudong side of the Huangpu river jump into your eyes. The tour also reveals the City’s green spaces, and provides the opportunity to hop-off at the Shanghai Museum. The pudong tour route travels through Pudong area where you will discover the magnificent skyscrapers in the heart of new Shanghai. Buses depart from the Cool Docks every hour from 9.00am until 5.00pm. The tour charts Pudong’s rapid development and takes you to Shanghai’s most famous building, the iconic Oriental Pearl Television Tower. The tour will take you through the centre of the Shanghai financial district, passing Jin Mao Tower and the city’s tallest building, the World Financial Centre. If you have a head for heights, you will be thrilled by the magnificent panorama visible from the Nanpu Bridge. Use the hop-on, hop-off facility to take a break at one of the bars or restaurants in the Cool Docks area, or hop-off at the Shanghai World Finance Centre. You can enjoy breathtaking, panoramic views over the city from the world’s highest observation platform located on the 94th floor. The Big Bus sightseeing tour of Shanghai includes an informative commentary that guides you through the city. It introduces the history of Shanghai, points out the buildings and landmarks of significance and gives an insight into Chinese culture and tradition. The personal recorded commentary is available in your choice of 8 languages: Mandarin, English, German, French, Spanish, Russian, Japanese and Korean. Complimentary earphones are provided. On the Big Bus tour there are more than 20 locations where you can get off the bus to visit attractions or explore places of interests. The hop-on and hop-off tour gives you the freedom to plan your own itinerary. Visit the places that interest you and explore as little or for as long as you like. You can hop on and off the open-top buses as many times as you want within the validity of your 24 hour ticket. The Big Bus Shanghai Sightseeing Tour includes entry to the Jade Buddha Temple. The Temple was founded in 1882 when two Buddha statues made entirely from Jade were imported from Burma. Over the years the temple has been embellished with new artifacts, becoming one of the most important Buddhist temples in Shanghai. Today, the courtyard is paved with stones etched with lotus flowers leading to the Great Treasure Hall where worshippers can pray to past, present and future Buddhas. The Grand Hall features three golden Buddhas, but the centerpiece remains the 1.9 metre, original pale-green Jade Buddha, now seated upstairs in its own hall and encrusted with jewels. If you would like your visit to bring you good luck, the surrounding shops can supply all you need for your visit, from incense sticks to bundles of ‘spirit money’ to be burnt in the huge incense pots. The temple is open daily. It also has a shop and a restaurant. Tea tasting is available. The Big Bus Tour of Shanghai includes a free 1 hour cruise on the Huangpu river. Hop off the Shanghai City Tour at stop number 15 and jump aboard the river boat for a graceful cruise down the Huangpu River. A boat trip on the busy Huangpu River offers a different way to experience the city and showcases the impressive Shanghai skyline. Enjoy the mix of traditional and modern buildings that line the Shanghai riverbank. The river remains an important transport artery, and the range of vessels give a great insight into the city’s rich trading heritage. Your cruise will take you on a 1 hour, circular trip before returning to the quayside where you can continue the Big Bus Shanghai City tour (Red Route). 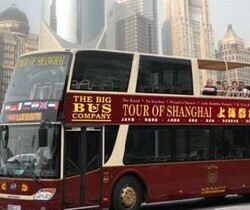 The Big Bus Sightseeing Tour includes entry to Madame Tussaud’s Shanghai. Since the original waxwork museum opened in London over 200 years ago, millions of people have flocked through the doors of Madame Tussaud’s. It remains as popular as ever. There are many reasons for this enduring success, but at the heart of it is good, old-fashioned curiosity. Today’s visitors are sent on a unique, emotionally-charged journey through the realms of the powerful and famous. The museum-style ropes and poles have gone so guests can get up-close and personal with A-list celebrities, sporting legends, political heavyweights and historical icons. Hop-off the bus at stop number 1 to experience Madame Tussaud’s Shanghai.